Prince George's County Firefighter/Medics went door-to-door throughout a Temple Hills community this morning checking to ensure everyone had a working smoke alarm. Nearly 90 homes were targeted for the Adopt-a-Neighborhood event sponsored by the First Baptist Church of Glenarden. 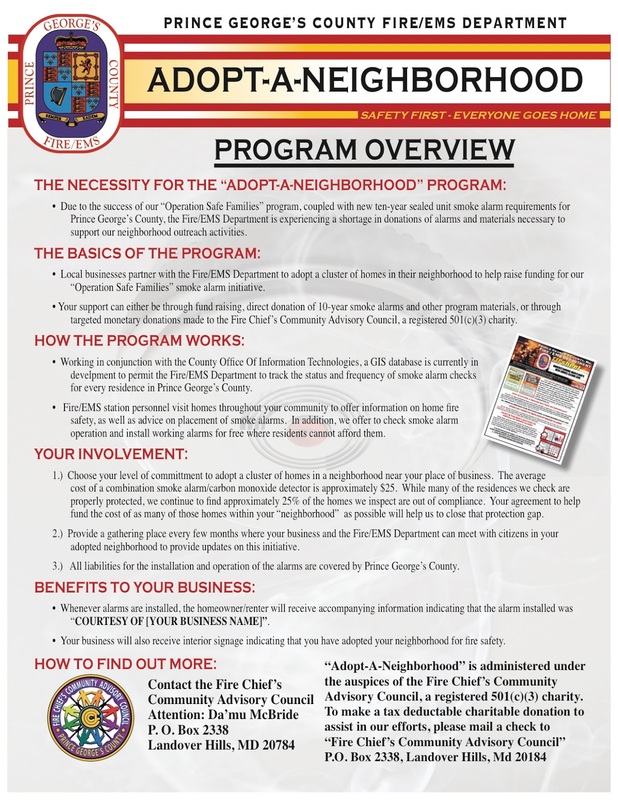 Sponsorship involved a monetary donation to the Community Advisory Council, a 501c3 organization, that used the donation to purchase smoke and carbon monoxide (co) alarms. After a community is targeted for saturation Firefighter/Medics canvas the community offering to check smoke alarms. If a home is found without a working smoke alarm a new 10-year device will be installed at a no charge. Firefighters are now using a mobile phone application that tracks homes visited and the smoke alarm status. The County-made GIS/GPS application allows supervisors to electronically view which homes have working smoke alarms and which homes need to be visited to have alarms checked. The Adopt-a-Neighborhood program uses this app to track smoke alarm status in homes we visit. The collector app is now used on all smoke alarm programs the Fire/EMS Department performs. A photo below shows the results of this mornings visit. In addition to civilian, volunteer and career members of the Fire/EMS Department a Boy Scout vying to be an Eagle Scout joined firefighters to learn more about this community outreach effort. Any business or other entity is encouraged to become involve in this effort and adopt a neighborhood. Green indicates a new 10-year smoke alarm installed. 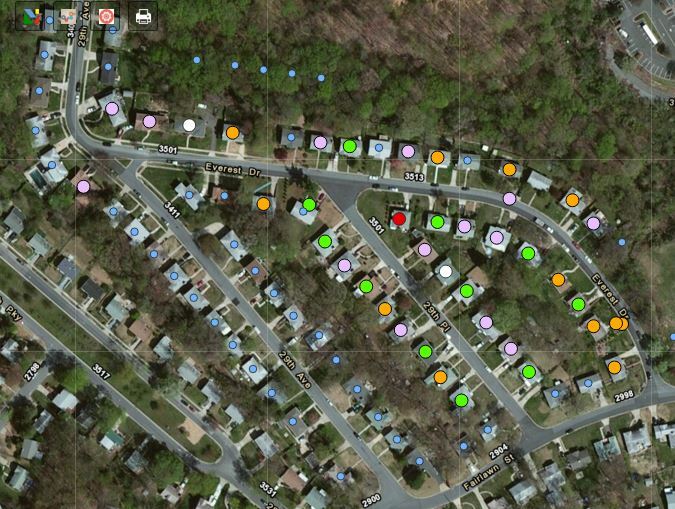 Orange indicates the home was already protected by a working smoke alarm and blue indicate a visit to pending. -Unusual items or situations: A vehicle is parked in an odd location, a package/luggage is unattended, a window/door is open that is usually closed, or other out-of-the-ordinary situations occur. -Eliciting information: A person questions individuals at a level beyond curiosity about a building’s purpose, operations, security procedures and/or personnel, shift changes, etc. -Observation/surveillance: Someone pays unusual attention to facilities or buildings beyond a casual or professional interest. This includes extended loitering without explanation (particularly in concealed locations); unusual, repeated, and/or prolonged observation of a building (e.g., with binoculars or video camera); taking notes or measurements; counting paces; sketching floor plans, etc. -If you see something suspicious, immediately call 911. -If you remember something you saw earlier – whether it happened a few hours or days ago – call your local law enforcement agency’s non-emergency phone number. Whenever I think about the Prince George's County Fire/EMS Department Bomb Squad I envision our members with nerves of steel, skilled hands, quick thinkers, patience and focused vision to the task at hand. I see the large protective suits, robots and portable x-ray machines being used to render safe a suspicious package. Our Bomb Squad is all that and much more but above all they are compassionate humans that began their careers as firefighters. At a recent PGFD Bomb Squad drill members used their skills to construct 48 "beeping" Easter eggs for visually impaired children. Bomb Techs used the opportunity as a drill in electronics with the outcome enabling visually impaired children the opportunity to hunt for Easter eggs. A typical egg hunt is a visual task but these eggs utilize a different sense. The eggs were constructed to allow for multi-time use and rough handling. The colorful plastic eggs and components were donated by the International Association of Bomb Technicians and Investigators. The completed "beeping" eggs were donated to the "Vision Program," a part of Programs and Services for the Department of Special Education of Prince George's County Public Schools. All images are provided with courtesy of the Prince Georges County Fire/EMS Department. Photo credit to Teresa Ann Crisman, PGFD. Since 2010, the Prince George’s County Fire/EMS Department has joined America in marking Breast Cancer Awareness Month by actively supporting awareness activities and fundraising efforts to fight breast cancer. 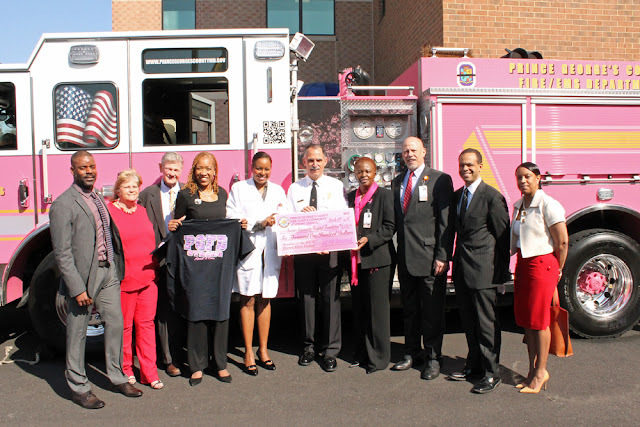 As part of our annual campaign, volunteer and career Firefighters, Paramedics and Administrative Personnel of the Department are permitted to replace their usual work attire throughout the month of October with shirts promoting awareness for all forms of cancer, especially Breast Cancer, which effects as many as one in eight women in America. 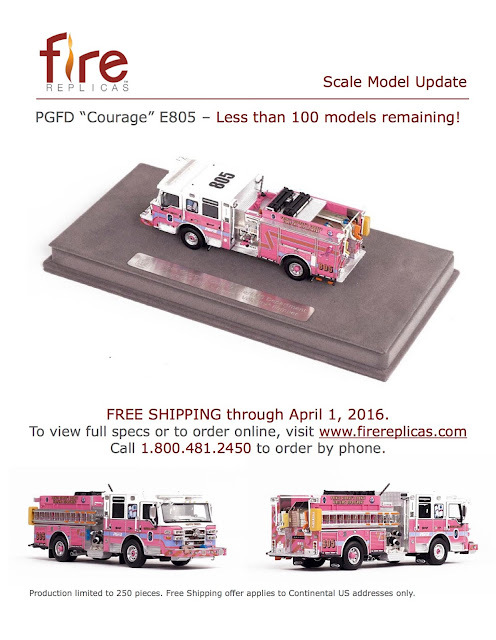 Each year, Fire/EMS Department personnel are invited to purchase commemorative shirts with all net proceeds donated to fund cancer charities. Proposed designs are created and submitted by members of the Department. Final selection is made by the Fire Chief on the basis of promoting awareness, as well as representing the commitment of the entire Department to extend the message of courage and hope to the communities we serve. Sales this year were managed through an independent Prince George’s County-based silkscreen vendor, First Impressions, Incorporated, of Bowie Maryland. All net proceeds were donated by the vendor, through the Fire Chief’s Community Advisory Council, to serve cancer charities. The 2015 campaign raised a total of $6,100.00, and the Doctors Community Hospital Foundation was selected to receive the charitable donation, earmarked to assist the Breast Center at Doctors Community Hospital. Official presentation of the check took place on March 16, 2016. Those on hand to receive the check from Fire Chief Marc S. Bashoor and Fire Chief’s Community Advisory Council Chair Cheryl Walker included, Paul Grenaldo, EVP and COO, Doctors Community Hospital, Charles Dukes, Chair of the Doctors Community Hospital Foundation (DCHF), Robyn Webb-Williams, Vice President, DCHF, Regina Hampton, MD, Medical Director, Doctors Community Breast Center and Terrie Trimmer, Director, Doctors Community Breast Center and DCHF Board Member, William Steen of Carrollton Enterprises. Doctors Community Hospital is a premier medical and surgical hospital located in Lanham, Maryland. With a mission of being dedicated to passionately caring for the health of patients and the community, the hospital has provided high-quality and comprehensive health care to residents of Prince George’s County and the region for more than 40 years. A 163-licensed bed facility that has earned numerous quality awards, Doctors Community Hospital provides a wide range of programs and services: Bariatric and Weight Loss Center, Doctors Community Breast Center, Center for Wound Healing and Hyperbaric Medicine, Comprehensive Orthopedic Services, Comprehensive Rehabilitation Services, Doctors Regional Cancer Center, Emergency Department, Imaging Services, Infusion Center, Joslin Diabetes Center, Doctors Community Rehabilitation and Patient Care Center (transitional care), Metropolitan Medical Specialists, Sleep Center and Vascular Health Program. To learn more about Doctors Community Hospital, visit DCHweb.org or call 301-DCH-4YOU (301-324-4968). Doctors Community Breast Center is the first comprehensive program with a dedicated breast surgeon in Prince George’s County. Located at Doctors Community Hospital in Lanham, MD, this center provides high-quality evaluation, diagnostic and treatment services – all at one convenient location. With a focus on helping women receive life-saving mammogram screenings, regardless of their ability to pay, the center also provides free screening mammograms to county residents who are uninsured/underinsured or those who have high insurance deductibles. To learn more about Doctors Community Breast Center or ways to support its community outreach initiatives, visit DCHweb.org/breast or call 301-DCH-4YOU (301-324-4968). Thirteen firefighters were recognized today and presented with Emergency Service Awards. Prince George's County Fire Chief Marc S. Bashoor presented the awards at an informal ceremony at the Forestville Fire/EMS Station 823. There were two separate incidents each involving a rescue. While making the presentation to each member Chief Bashoor stated, "Your performance on the scene of this incident possibly saved a life or prevented serious injury and is commendable and worthy of recognition. Therefore, you are hereby awarded a Fire/EMS Department Emergency Services Award. Your actions reflect well on you both personally and professionally and exemplify the excellent caliber of service we strive to provide to the residents of Prince George’s County." On January 5, 2016, Fire/EMS Department units responded to a reported house fire at 9400 Old Marlboro Pike. Upon arrival, firefighters were advised that someone might still be inside the home. Crews quickly began an aggressive search for a possible victim but none was found. Fire had extended into the attic space; and a crew was tasked with opening the roof in support of the interior operations. During the roof operation, a firefighter fell through an opening and was exposed to high heat up to his shoulders. Command and the RIT witnessed the event and immediately deployed personnel to assist. Ritchie Volunteer Assistant Fire Chief William Cunningham supported the fallen firefighter until additional resources reached them. Captain Donald Fletcher, Fire Fighter/Medic Lieutenant Christopher Blackistone, and Fire Fighter William Philpott removed the firefighter from the opening and assisted him off the roof. He was placed in the care of EMS personnel, evaluated on the scene, and released to duty. On the morning of Sunday, January 17, 2016, units from Silver Hill Fire/EMS Station 829 responded to 3105 Bellbrooke Court in Temple Hills for a house fire, reportedly with people inside. Firefighters arrived to find a basement fire with a trapped occupant and immediately advanced an attack line through the basement’s entrance at the rear of the home. Despite encountering high heat and zero visibility upon entering the residence, Fire Fighter/Medic Captain Bilko was able to quickly locate the victim. Fire Fighter Tippett held the attack line toward the fire, while Fire Fighter DeForest and Fire Fighter Singleton removed the victim from the burning home. Once outside, the pair assisted Fire Fighter Crooks and Fire Fighter Jenkins with administering initial treatment. Consequently, the patient was transferred to Acting Fire Fighter/Medic Captain Buffum, Fire Fighter/Medic Lieutenant Dowling, and Fire Fighter/Medic Rohrbaugh. The administration of aggressive EMS care allowed for quick transport to Medstar; and, thankfully, the patient is expected to recover fully. The entire crew attending todays ceremony. Congratulations are in order, again, for a Prince George's County Fire/EMS Department Acting Assistant Fire Chief for being recognized at the Maryland State level of the Veterans of Foreign War (VFW). Shayshan Conver-White was nominated by the VFW Post 7757, Kettering-Largo, as the State Firefighter/EMT of the Year. Confer-White was awarded last month as one of the local recipients for this honor. Assistant Fire Chief Sayshan Conver-White was selected for her Safety Officer accomplishments including but not limited to Chairing the Washington Metropolitan Council of Governments Safety and Health Committee, Co-Chair of the Maryland Emergency Services Life Safety Task Force and being chosen as the National Safety officer of the Year in 2015. Conver-White has been recognized by several organizations for her work with the Department over the past year. 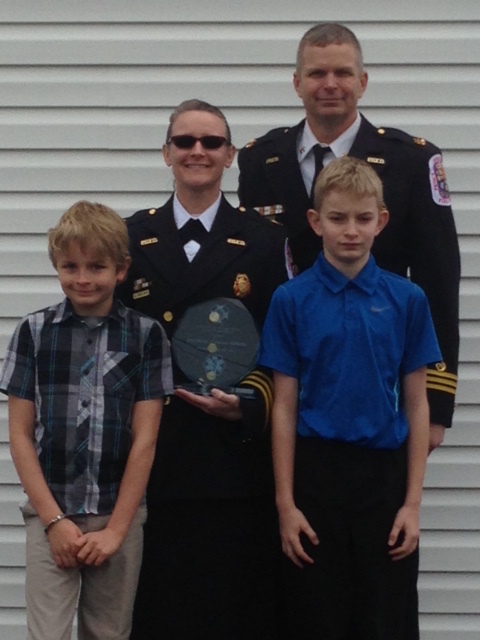 Assistant Fire Chief Conver-White holds her award received today. Wither is husband Steve and sons Colby and Trent. It is no secret that our current Medical Director has been preparing to end his many years of service with the Prince George’s County Fire/Emergency Medical Services (EMS) Department. After 24 years, Dr. Terry Jodrie will be leaving the department to pursue other interests after his current contract ends in April 2017. Jodrie feels that one of his most important responsibilities is to prepare someone to take on some of his responsibilities over the next year and fill his role until a new permanent Director can be contracted. The Fire/EMS Department's Medical Director Terry Jodrie attended the monthly Command Staff meeting on Friday, March 5 and invited Dr. Michael Millin to attend with him. Millin will serve as the Departments Associate Medical Director until a permanent selection to replace Jodrie is made by the County. After a morning long staff meeting, Dr. Millin rode along with Assistant Fire Chief Brian Frankel, Commander of Emergency Medical Services. They stopped by the Capitol Heights Fire/EMS Station 805 to visit with the Firefighter/Medics when the station was alerted for a possible working code at a nearby dialysis center. Dr. Millin immediately took the opportunity and rode with Engine 805’s crew to the scene of the incident. Medics from the near-by Kettering/Largo Fire/EMS Station 846 were also dispatched to provide advanced life support. Upon arrival crews found a pulseless and non-breathing patient and began to work on the patient. Dialysis center staff had witnessed the patient go into cardiac arrest and immediately provided CPR. This first step in the “chain of survival” definitely led to the positive outcome for this patient. Within moments of Engine 805’s arrival, an AED was applied and medical care under the direction of Dr. Millin was started. Soon after the arrival of Medic 846, important medications were administered and the patient had regained a pulse. Dr. Millin, the crew from Engine 805, and Medic 846 continued advanced life support care on the way to the hospital. Emergency Department staff advised that the patient had a good prognosis for survival. So the new Associate Medical Director for the Prince George’s County Fire/EMS Department, Dr. Michael Millin, has had a very good first day. Millin has some very big shoes to fill and he is off to a good start. Additional information about Dr. Michael Millin. 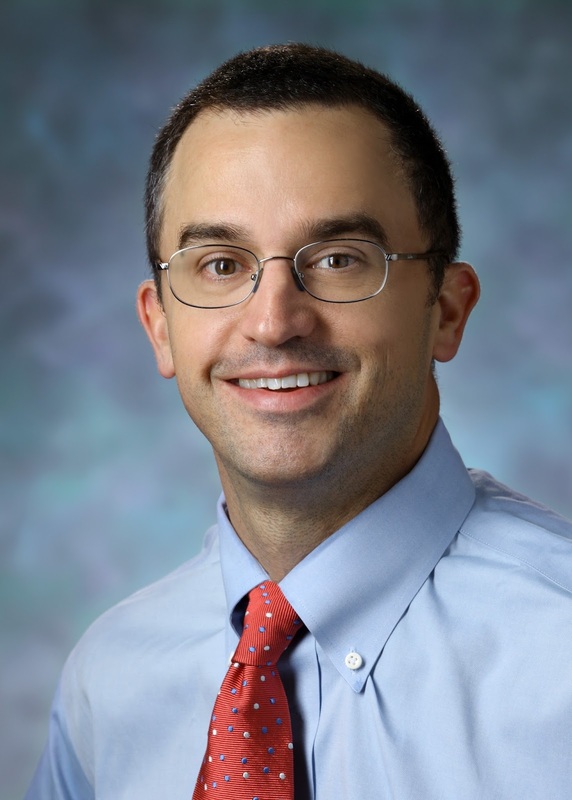 Sub-boarded in Emergency Medical Services (EMS), Dr. Millin joined the faculty with the Department of Emergency Medicine at Johns Hopkins in 2004 after completing a two year EMS fellowship and his MPH in Health Management and Policy in Portland, Oregon. Millin has been the medical director for the BWI Airport Fire and Rescue Department since 2008, and the Johns Hopkins Lifeline Critical Care Transport Program since 2010. In addition, he serves on the state EMS protocol committee with the Maryland Institute for Emergency Medical Services Systems (MIEMSS), the State of Maryland Cardiac Arrest Steering Committee and he is the vice-chair/secretary of the EMS Physicians Committee of the Maryland Chapter of the American College of Emergency Physicians. Nationally, Dr. Millin is the vice-chair of the Resuscitation sub-council of the American Red Cross scientific advisory council. He is also a past chair of the Standards and Clinical Practice Committee and the immediate past chair of the Wilderness EMS Committee with the National Association of EMS Physicians. He also works as a disaster physician for the Federal Government as a medical officer with the New Jersey Disaster Medical Assistance Team (NJ -1 DMAT). Academically Dr. Millin has published over thirty peer-reviewed articles in the fields of EMS, trauma care and disaster medicine. He has authored numerous chapters in various EMS textbooks, and he has spearheaded the development of over ten national position statements regarding the development of EMS systems and the role of physician medical oversight in EMS. Dr. Millin got his start in medicine working as a professional ski patroller in Utah. He is a past national medical advisor for the National Ski Patrol and currently is the medical director for Maryland Search and Rescue (MSAR), a vetted search and rescue (SAR) team with the Maryland Search Teams Task Force and the Appalachian Search and Rescue Conference (ASRC). In his free time, Dr. Millin enjoys being with his wife and kids and enjoying outdoor activities, especially skiing, hiking, mountain biking and canoeing.